Yesterday I came across this research report from SCM World titled The Digital Factory: Game-Changing Technologies That Will Transform Manufacturing Industry. For this research they collaborated with MESA International on a joint survey to define the landscape of manufacturing technology tools and defining an investment priority timeline. 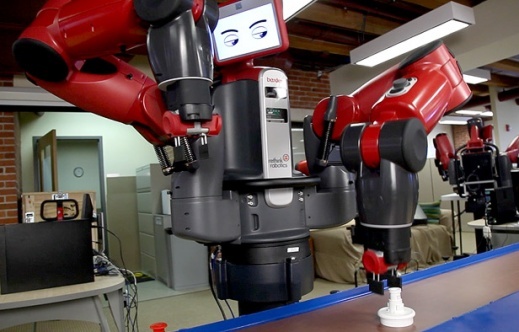 It shows that Big Data Analytics, Mobile Technologies and Robotics are defining the future of digital factories. In this post I want to highlight some of the findings and results from the report. Sometimes the most interesting thing statistics show is in the information not communicated.. 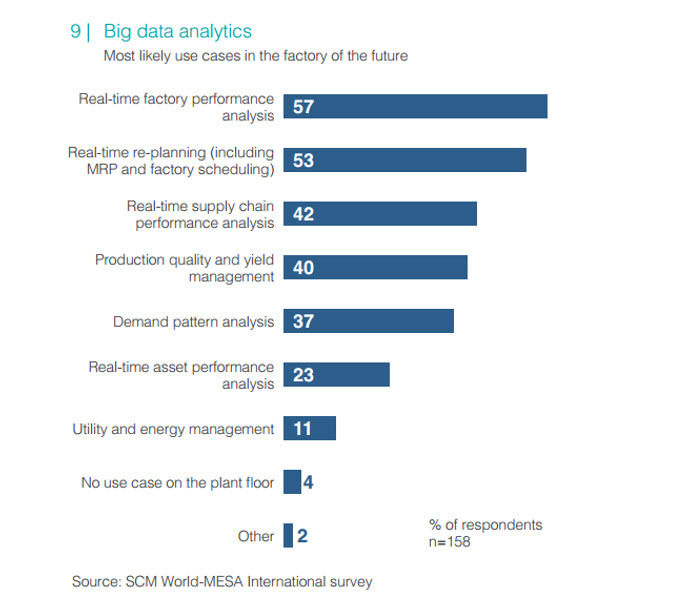 I think its at least notable that 53% of manufacturers do NOT expect big data analytics to have a major impact on company performance. 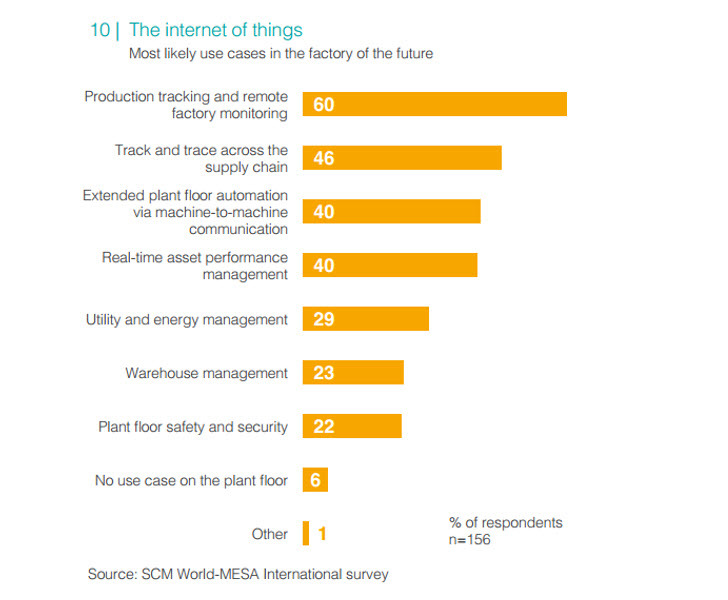 With regards to the internet of things SCM World found only 6% of manufacturers with no use case of the Internet of Things on the plant floor. The main IoT focus of manufactures is on production tracking and remote factory monitoring (60%), track and trace across the supply chain (46%), and extended plant floor automation via machine-to-machine communication (40%). 3D printing is another interesting technology for manufacturing. Boeing is one of the early adopters of 3D printing technology, making more than 20,000 3D printed parts for 10 different military and commercial planes. SCM World found that the 787 Dreamliner has 30 3D printed parts, including air ducts and hinges, which is a record for the industry. 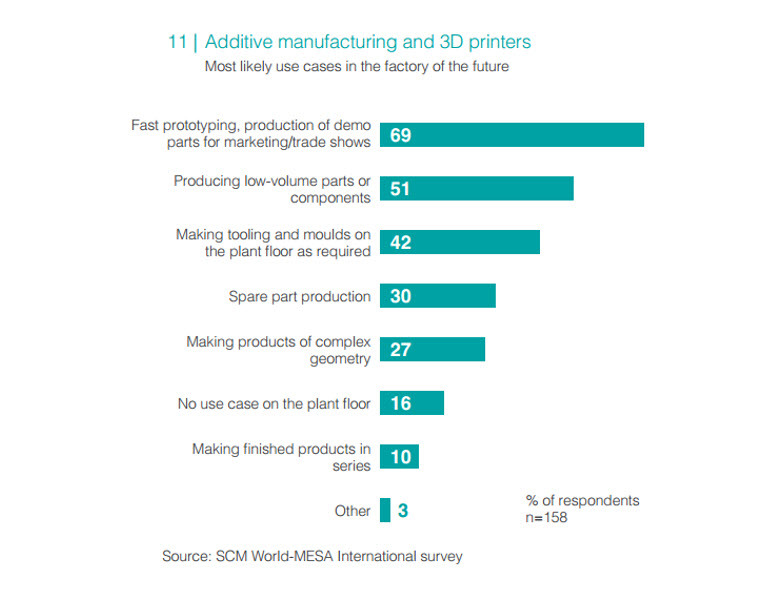 The applications of 3D printing range from prototyping (69%) to the production low-volume parts or components (51%) and making of tools and molds on the plant floor as required (42%). In general mobile technologies and applications (75%), big data analytics (68%) and advanced robotics (64%) are considered the three most disruptive technologies by manufacturers today. 58% of manufacturers are either piloting or planning to invest in mobile technologies and applications, followed by big data analytics (49%). 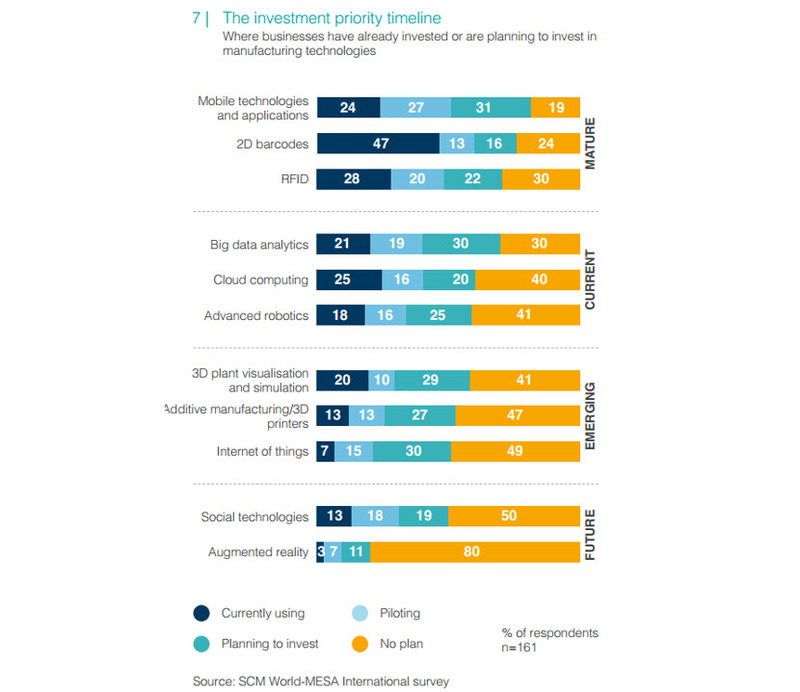 The following investment priority timeline illustrates how manufacturers are prioritizing their technology investments by future, emerging, current and mature technologies. 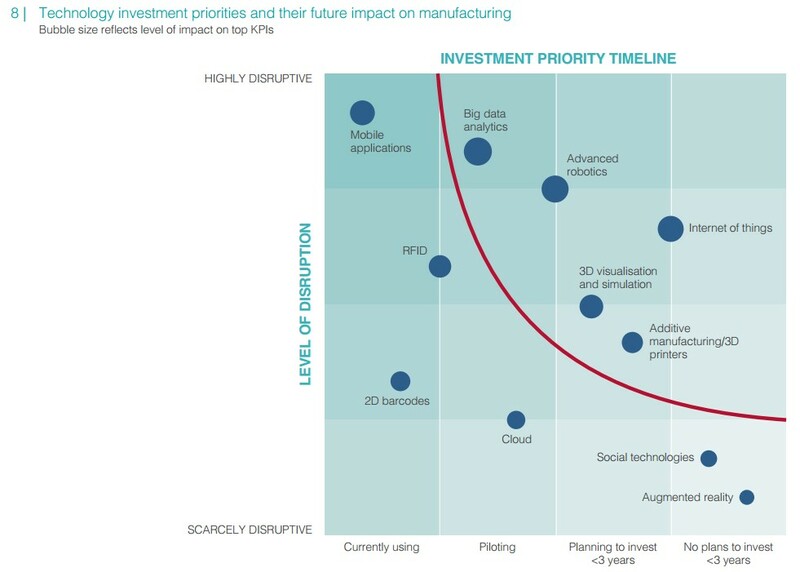 Comparing the investment priority timeline and level of technology disruption in the following technology investment priority grid further clarifies the impact of each technology on manufacturing. 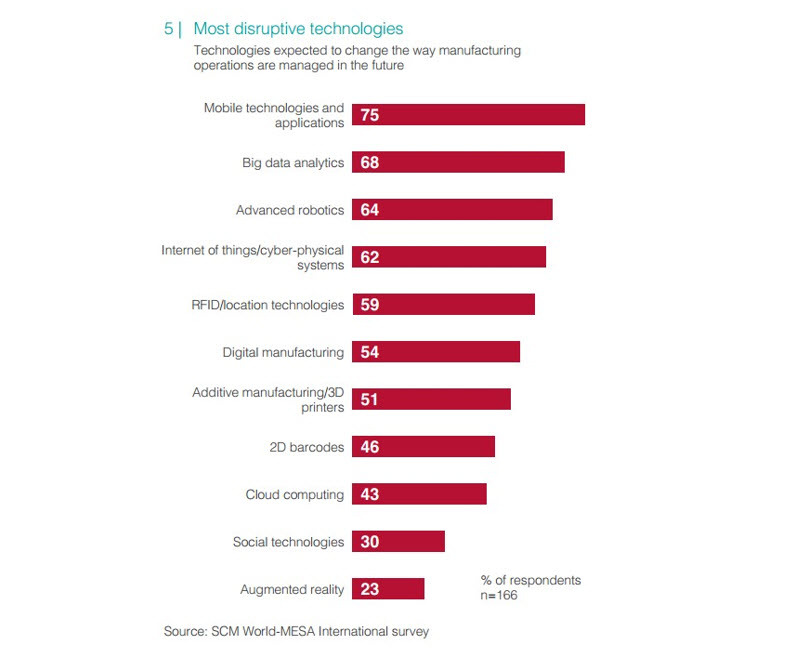 SCM World believes the five technologies to the right of the red curve will drive the greatest disruption in manufacturing in the next few years. So there you have it. 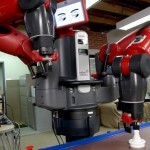 The future of manufacturing based on input by the industry itself. It might be useful to spark a conversation with colleagues, partners or clients. To get yourself started with either Big Data, Internet of Things or dealing with disruptive innovation, check out some of the research we did on those topics. SCM World, The Digital Factory: Game-Changing Technologies That Will Transform Manufacturing Industry by Pierfrancesco Manenti, November, 2014. Hello Thomas, for your information 2 points that you are emphizing in your blog and on wich we are working trough DefiH contest. See https://www.poppy-project.org/ to have more infos and follow @ProjetCherry on twitter if you are interested in. Thank you Jacques, I will make sure to follow the project.